NEW YORK (WABC) -- At the early age of five, Lesandro "Junior" Guzman-Feliz wanted to become an NYPD detective. He later enrolled in the NYPD Explorer Program as a teenager, his first step in pursuing his dream. That dream was destroyed Wednesday when the innocent 15-year-old was fatally attacked in front of a Bronx bodega by a group of alleged gang members. Police believe Guzman-Feliz was the victim of mistaken identity. 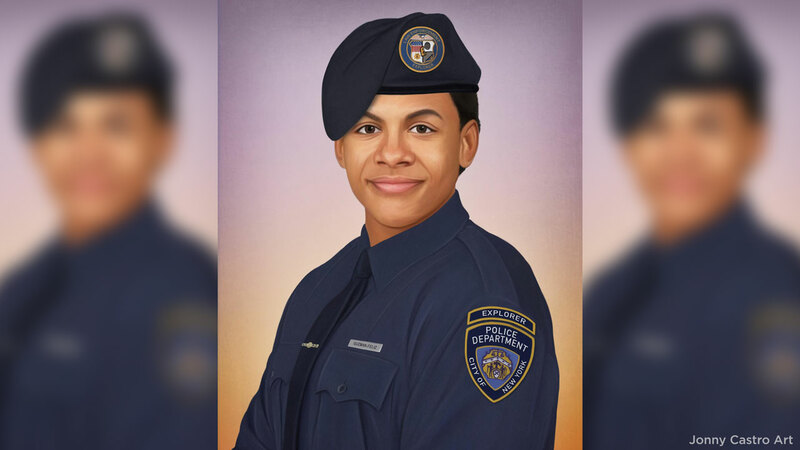 After hearing the public outcry prompted by #JusticeForJunior on social media, artist Jonny Castro created a portrait of Junior smiling, clad in an NYPD Explorer's uniform. Castro said plans to hand deliver a 16" x 20" version of the portrait to Junior's mother. "I have no doubt in my mind that Junior would've made an outstanding Police Officer," Castro wrote on his Facebook page. "He had blue coursing through veins at an early age, and that makes him family to me and every other officer that wears the badge." Castro works fulltime as a forensic composite artist in Philadelphia, but the army vet also uses his talents to create portraits of fallen heroes. Those portraits are then donated to the officers' families or their colleagues. Officer Jonny Castro, an army vet, creates portraits of law enforcement officers killed in the line of duty.